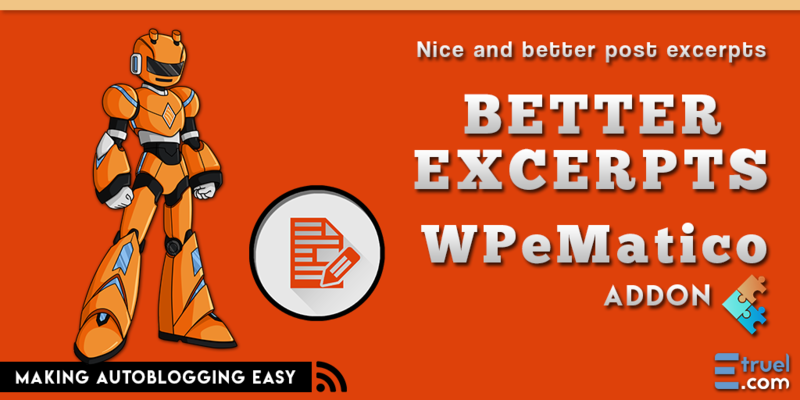 WPeMatico Better Excerpts WordPress plugin. 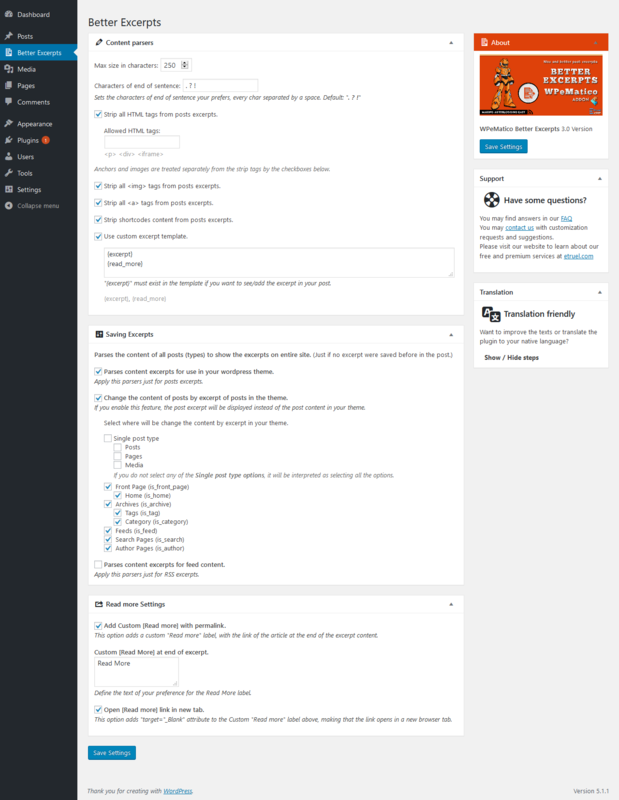 It notably improves the standard WordPress excerpts, allowing to use multiple filters and options to modify their contents with customized configurations. 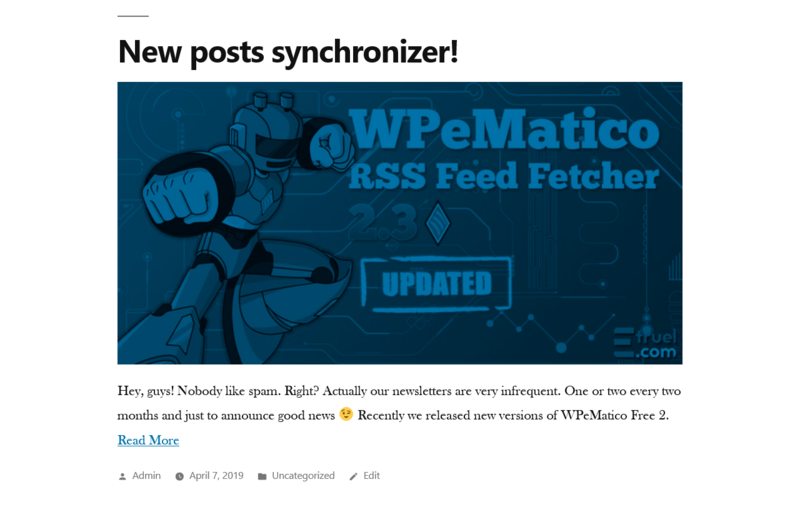 WPeMatico Better Excerpts works as single WordPress plugin or as a WPeMatico Addon to get nice and better excerpts in front end and feed contents. This means that you don’t need the WPeMatico plugin installed and activated to use this plugin. Among other things, you could select to save excerpts as post content from posts published by WPeMatico or use them with all posts excerpts on fron-end, in entire site or just in each item content of the RSS feed. Limits the number of characters in excerpts. Sets the maximum number of characters that excerpts may contain. Allows you to configure which characters indicate end of paragraph to create a more accurate and complete excerpt. Preventing cuts in the middle of a sentence. This function allows you to replace the content of the posts with the generated excerpt. Strip the HTML tags and shortcodes you don't need. Allows you to remove or not all unwanted HTML tags from the content of the excerpt, as well as the [shortcodes]. Strip (or not) all images tags from the excerpt. Allows you to remove all images added in <img> tags from the content before creating the excerpt. Strip (or not) all anchors tags <a> from the excerpt. Allows you to remove all links added in <a> tags from the content before creating the excerpt. These tags often cause problems when Better Excerpt finds a dot in the link by taking it as the end of a paragraph. 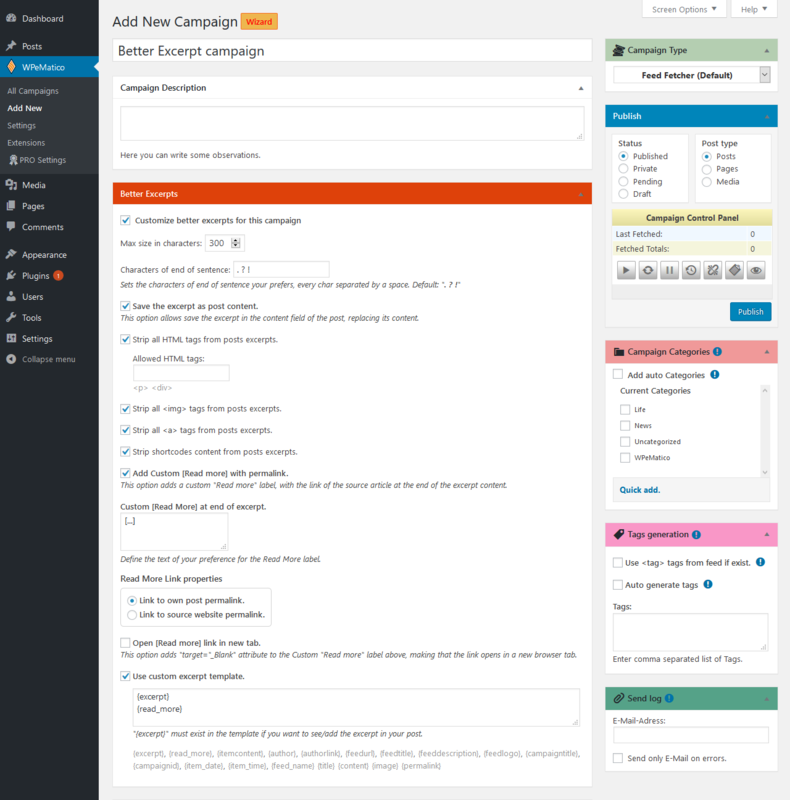 Excerpt Template globally and by campaign. A template can be used to make globally changes to all the excerpts, parsing them by adding extra information, such as “read more” link, text, campaign data, etc. You can use some tags that will be replaced for current value. Each WPeMatico campaign can manage individual excerpt templates. Parse the content of all posts or only those created by WPeMatico. Allow to parse the content of all posts (types) to show the excerpts on entire site or only those created by WPeMatico saving the excerpt in each inserted post. Show the excerpt instead of the content of the post in your theme. You can select on which pages of your website you want to display the excerpt instead of the content of the posts. 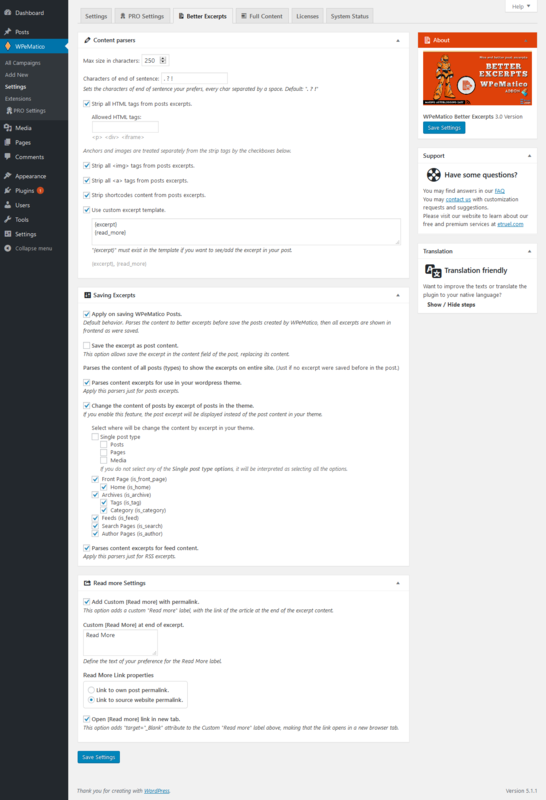 Parses the content excerpts only for feeds..
Parses the content of all posts (types) to show the excerpts on the items of your RSS feed. Allows you to customize or strip the text of the “Read more” link at the end of the excerpt. Allows you to select where the “Read more” will link, to the source article or to your own article, and also whether it will open in a new tab. PHP 5.3 or bigger must be installed in your server. 1. Unzip plugin archive and put the folder into your plugins folder (/wp-content/plugins/).